Hayes’ Terin Kinsway (5) puts up a shot in traffic during a game against Buckeye Valley last season. It seems like every year the Delaware Hayes boys basketball team has to replace its top scorer, and this season is no different. 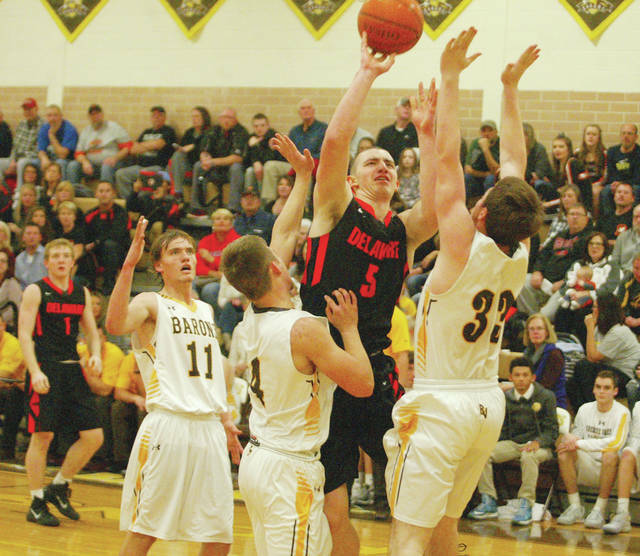 Will Yoakum, who averaged 19.2 points per game last season, has moved on to play at West Liberty at the NCAA Division II level. Yoakum joins a list of former Pacers currently playing at the college level such as Griffin Kinney (Appalachian State), Mike Wells (Saginaw Valley State), Phil Frentsos (Ashland), Alex Stevens (Ohio Dominican), Khalil Iverson (Wisconsin) and Zach McIntire (Mercyhurst). Outside of Yoakum, the Pacers lost Kameron Beekman, Sam Midura and Anthony Rodgers to graduation. Odds are that it’s junior Terin Kinsway, who averaged 11.3 points, seven rebounds and just short of two assists per game – the latter two led the team last season. Kinsway not only enters his third season at the varsity level, but his third season as a starter. Still, 19.2 per game is a lot of points to replace. So, where will Blackburn look for production? Spoiler alert: it’s not going to be just one guy. Outside of Kinsway, the Pacers return four letterwinners led by sophomores Nate Griggs (guard), Addison Harvey (guard) and Paul Burris (forward) and senior guard Tracey Sumner. Blackburn has high hopes for his newcomers to the varsity level. Seniors Paul Frentsos (guard) and Dominic Byers (forward), juniors Jwan Lyles (forward) and Jack Weller (forward) and freshman Ryan Smudz (guard) should all contribute this season. Delaware finished 11-12 last season, including 4-8 in OCC play, which was tied for fifth in the OCC-Cardinal behind champion Hilliard Bradley. The Pacers lost at Dublin Scioto in the first round of the tournament – it’s second straight opening-round exit. Delaware opens in the Grove City Tip-Off Classic against Independence Dec. 1 at 6 p.m. and will play either host Grove City or Mifflin the following day. Buckeye Valley boys basketball coach Andy Gast can relate to Norman Dale. With eight players on the roster, it is going to be a lonely bench on the Baron sideline this season. But Gast (fifth season) thinks what his Barons lack in numbers, they’ll make up for in skill and effort. Senior Ethan Crawford (guard) highlights a group in which all eight got varsity experience last season on a squad that finished 7-16 overall and fifth in the MOAC at 5-7. “I don’t think you’ll necessarily see his stat numbers increase. That’s (because) our younger guys are getting better and I think Ethan’s going to benefit from that,” Gast said. Crawford led the team in points and assists, but also led in shots at 194, which was 60 more than second most. He also led the team in turnovers with 69, which wasn’t a problem for Gast. He said he needed the ball in Crawford’s hands. This year, seniors Elijah Jackson (guard) and Austin Richard (forward) and sophomore Dylan Herbert (guard), who all saw significant time in either starting roles or off the bench, should help Crawford with the load. Sophomore forwards Clark Newland and Max Stokey and junior guards Luke Lucas and Stone Foltz should all be big contributors as well. At 6-foot-5, Stokey is the tallest player on the team. The MOAC loses Jonathan Alder, but gains Clear Fork and Ontario – two programs that have had success in recent history. BV will face a tough non-league schedule, as always. The Barons face county competition such as Big Walnut (away Dec. 1), Olentangy Orange (home Dec. 2) and Delaware Hayes (away Feb. 16). BW is BV’s season-opener and Orange opens the home slate. Outside the area teams, Bishop Watterson (home Jan. 9) and Heath (home Jan. 27) are also key games on the non-league schedule.